A pumpkin pie, a cheesecake and a pop tart just got together had a baby and created this delicious pop tart. This has to be one of my favorite combinations during the this pumpkin spice season. I've made a pumpkin spice cheesecake for the holidays for the last couple of years. If you have been following my blog you would have seen several other pumpkin spice post: Pumpkin Spice Extract, Pumpkin Spice Syrup, Slow Cooker Pumpkin Butter, Pumpkin Spice Pound Cake, and Pumpkin Spice Sugar Cookies. So this year I decided to combine a pumpkin pie and a cheesecake in a little pastry instead of making a whole pumpkin spice cheesecake. I will be making hand pies closer to the holiday dinner season called Thanksgiving in America so keep an eye out for that. I've made some other tasty pop tart last month Maple Brown Sugar Cinnamon. Note: This is a double recipe from the original. 1. Combine all purpose flour, sea salt, sugar and cinnamon. Add chilled and cubed butter to the flour and cut butter into the flour with a pastry blend until small chunks. 2. Mix milk and egg together in a separate bowl. Add half to the flour-butter mixture and gently mix then add the last to the flour and tip over onto a flour surface. Gently kneed the dough until it holds together. Wrap in plastic and pop into the freezer for 30 minutes. 3.In a small bowl, combine cream cheese, sour cream, egg, vanilla extract, sugar and flour. Mix together with a hand mixer until well combined. Place in refrigerator. 4. Combine pumpkin puree and pumpkin spice, set aside. If using pumpkin butter can skip this step. 5. On a piece of flour waxed paper, roll out dough to a 1/4 inch thick. Cut out dough into a 3 by 5 rectangles. 6. Transfer pastry crust onto parchment paper cover cookie sheet. Spoon on 1 teaspoons of pumpkin pie filling then 1 teaspoon of cheesecake filling. 7. Press edges down to seal it then go around with a fork. Puncture the top with a fork once. Chill pastries for 30 minutes. 8. Preheat oven to 350 degrees (325 degrees if your oven runs hot). Whisk together egg and milk. Brush egg wash onto prepared pastries. Bake for 20 to 25 minutes or until golden brown. 9. Let pop tarts cool on the pan for 5 minutes then remove from pan to cool completely. Store in an air tight container for up to 2 weeks. I always thought pumpkin spice and cream cheese go well together. These look delicious! I love making poptarts at home, so much better than the store bought ones! perfect recipe for the season! These sound like the perfect Fallish pop tarts. And I love anything with cream cheese & pumpkin. Yum! These look like the perfect Fall-ish pop tarts. And I love anything with cream cheese & pumpkin. Great combination.Yum! That is so fun! These sound way better than the store bought kind! Perfect for fall! where has this been all my life! Yum yum yum! This looks and sounds so delicious. It is perfect for Halloween. Thanks for sharing. Pumpkin anything sounds good to me and this recipe looks extra delicious - you're making me really hungry as always. LOL! I think I'm gonna try to make this, I hope it comes out equally yummy as yours. Thanks so much for sharing! You come up with such great recipe ideas! I want to try this one too but with sweet potatoes. These sounds so yummy and fun! I will have to whip them up with my niece for a Thanksgiving breakfast! Looks so yummy! I love the creativity here :) What a fun fall recipe! The best of so many desserts - Pumpkin Pie, Cheesecake, and Pastry....sounds delicious. And, since you can hold them in your hands, these would be perfect to take trick-or-treating next week. That recipe definitely wins it, especially since you can have it for breakfast. I love that combination of pumpkin and cheesecake. I'm sure this tastes amazing! I love pop tarts and these sounds amazing. I can’t wait to try it. My children would love, homemade pop tarts. this is the coolest homemade poptart ever! i love how seasonally appropriate it is for right now too. it would travel great for breakfast on the go too. Those pop tarts look so good. It has been a while since I made pop tarts so I will be trying your recipe. I think the cream cheese and pumpkin spice combo would be so delicious! Mmmmm, these look fantastic! and Kerrygold butter is sublime! These look like they are super flaky too, just the way they should be. Love all things pumpkin! Oh wow! This really is a unique combination. I'm really intrigued by it so fortuately for me it looks incredibly easy to veganise. Thanks for the idea! This looks amazing! Very Fall appropriate. I will try to make it at home. Yum! My kids would really enjoy these and I love that drizzle over the top. So perfect for the season. Fantastic autumn recipe. Just perfect for the coming festive season, both casual and formal affairs! This has Halloween written all over it! I saw your other pop tart recipe and since then I've been trying to convince myself to make some, what intimidates me is the crust! I should get over myself and make this one! Halloween or not, these are delicious. Super easy recipe too. Thanks for sharing. These look so warm and delicious! I love the combination of pumpkin spice and cream cheese. These are great for a mid morning snack. 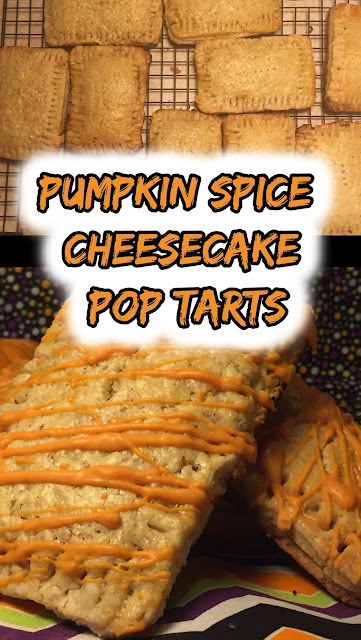 I was thinking to make pop tarts with Fall flavors for my children this days as I have plenty of homemade pumpkin purée, I have to try this recipe! Oh this looks so delicious! My kids will definitely love this. Thanks for sharing. This looks like an amazing combination! The kids will love it!